Ugadhi the popular Telugu festival in India is near-by. It is always a blessing to organize and observe such a beautiful festival. One more way to celebrate it happiness by watching blockbuster family entertainment Telugu movies with all family and friends. Ugadhi Special Movies are featured on YuppFlix for everyone to enjoy and watch. You can stream these films to watch with your family. 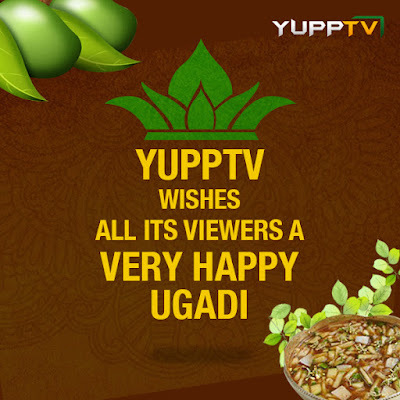 As well as there are variety of Telugu channels in YuppTV Telugu Package to choose from. You will be glad and content with the amount of special programs this channels telecasting specifically for Ugadhi festival. Watch the latest and hit Telugu movies on YuppFlix. Browse on to the most updated compilation of Telugu films. With an abundance on Telugu channels, you are sure to find what suits your taste on YuppTV. You’ll be able to see colourful Indian Telugu History unfolding before your very eyes in just one click of a mouse. YuppTV has tons of live stream TV options that could keep you hooked for hours on end. Since the Telugu New Year is the best time to celebrate with the family, do it in the most convenient way. At home with this family oriented movies, teach your children what the celebration really meant. The site is very easy to use with search features that would make your browsing experience so much more worth your every minute. It is accessible anywhere as long as you are connected to a WiFi device to browse. The best part of the YuppTV and YuppFlix deals is that it is affordable. YuppFlix provides a free two week’s trial for people who would like to test the service first. You may choose to chat with a live person as well who would gladly accommodate all of your questions. After which we are sure you’ll sign right up. YuppFlix library is backed by over 5,000 movies across different genres in 12 languages, including Tamil, Hindi, Telugu, Malayalam, Bengali, Punjabi and Kannada. The service will inform the users about the availability and internet premieres of movies through posts and push notifications. So indulge in the festival, celebrate Ugadhi the YuppFlix way.